Japan Fair is a charity event where you can buy new items from japanese creators which will be donated by 100% or 15% for Shelter Box. Shelter Box is an awsome organisation that helps communities overwhelmed by disaster and humanitarian crisis. I’am really a fan of charity in SL why i think such events must be made more public. Japan Fair also gives infos about how much is donated for shelter box so far. Have a look at the Japan Fair Blog and at Shelter Box too, cause you can find plenty of information where they helped and where they are helping right now. Also you can find some informations about shelter box at the fair, and there is a nice shrine with a little festival place around it where you can get some gimics like the little fish in the bag i’m holding. There are many nice cloth, accesoires and hairs at the fair and i think it is always nice to know even when i’m buying things i adore i can help others. Also men should have a look at the fair, cause gabriel and some other decent store are participating. So go and shop for a good purpose today. time to announce another great event that will start this month. 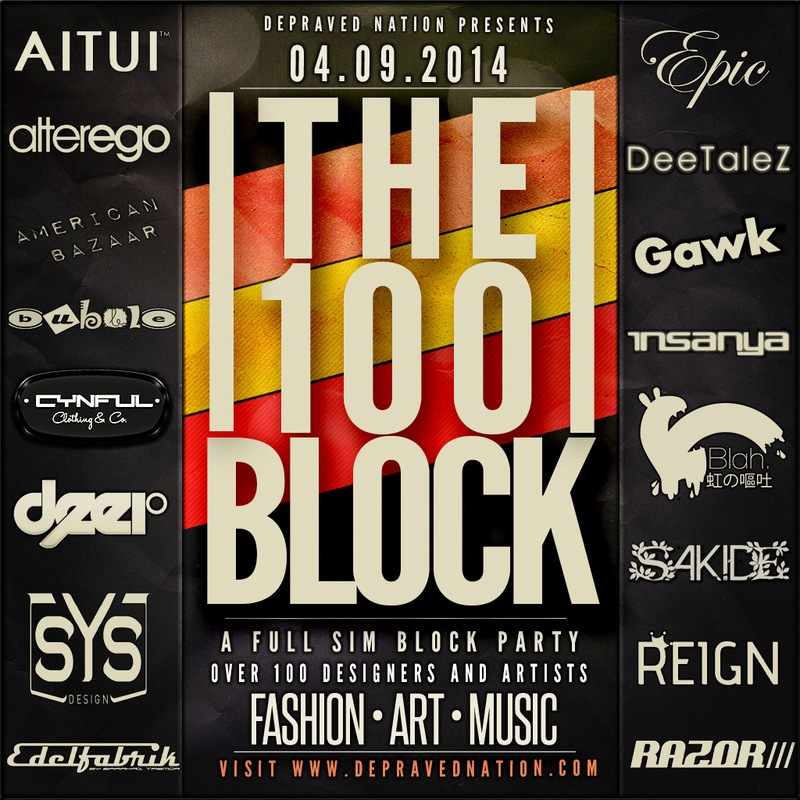 The 100 Block is back for you. that will bring you all new and and exclusive Items for this Event. So stay tuned for some hot upcoming news about the 100 Block. after a relaxing sunday i bring you a cross dressed look with some upcoming items and some items i really adore but hadn’t blogged so far cause there had always been other things in priority to be blogged. I really like every item i show to you in my posts since when i started blogging i’ve decided to blog only things i like even if that means i have to pay for them cause style won’t be a question of getting items for free or not. I really adore all of the shops i showcase to you and if i put a special light on a shop, then cause i have some items i put out again and again to wear them. So happening with my blouse and dress from Violent Seduction. I bought this dress and blouse month ago and everytime when i scroll trough my inventory i stop at it put it on and wear it until i’m in the mood for blogging and mostly then i have to take it of cause i have a special idea in mind or just cause it won’t fit to the items i want to blog that day. For today i find a style that fit, there for i combined it with new headphones from RO, a manover gear from Kera Kera, gloves from Izzies, ruffeld socks from tsg, one of my favorit shoes from fri.day and a cute moon shaped nosepiercing you can find at the cutie moon fair. But enough bla bla from me go on for the shopping list cause there are some cute and cool upcoming items for you. today have to inform you about 2 upcoming events. First one is the Rock Attitude Fashion Fair which will start on 29th of March and my hairs are one of the exclusives Run Away made for it. The second event i must tell you about is the Cutie Moon Fair. I’m sooooo excited for this event and soo happy cause i’m chosen to be part of their bloggerteam \o/ Cutie Moon is an event related to Sailor Moon so all items you can get there are exclusiv made for this fair and are all inspired by Sailor Moon. The first item i will show you from this event is a gift that everyone can get at the start point when the fair opens it doors on 1st of April. The second item from Cute Moon is this little Computer i’m wearing on my second photo. It’s one of the items Mish Mish made for the Fair and it comes in a bunch of colors. So stay tuned to see a lot more sailor moon related items in the next day cause it is said that there are 30 Stores participating in this event that will last 2 weeks. today i bring you again some news from the Suicide Dollz. Also i have to show you those new horns from Tabou Irresistible they are available in two versions and come with a tattolayer i’m not wearing cause i like the new facepaints from Nox so much. My hair is from Milk for this round and she did a really cool dread updo again. At least i will name my top which is the new mainstore release from Babydoll. it’s time for a new dress and Thyri from DE Designs is the second fitted mesh dress he released. I have to thank Xanthe cause i’ve seen the dress on her plurk and asked from where it is. We all know liquid mesh (by redgrave) and molten mesh (by egoisme) and like if posted last year those technics had some issues cause they won’t work with the bodyfat sliders and you have no chance to change your breast size… i’ve talked about that with Ramses from Egoisme here. With fitted Mesh those issues are gone. You can see it later on cause i’ve added a tiny gyazo at the end of this post. I was thinking about adding an video but …i honestly have to say, i’ve no idea about making videos of my sceen in good quality(and a filesize that flickr will allow me to upload), but i think the gyazo will show you that it works. I’ve tried so many things yesterday i’ve changed all sliders in the Appearence Editor and with some exceptions this dress really goes with all of them from 0-100 and even physics work with it!!! I’m really excited about which creators will come up using this new technic. 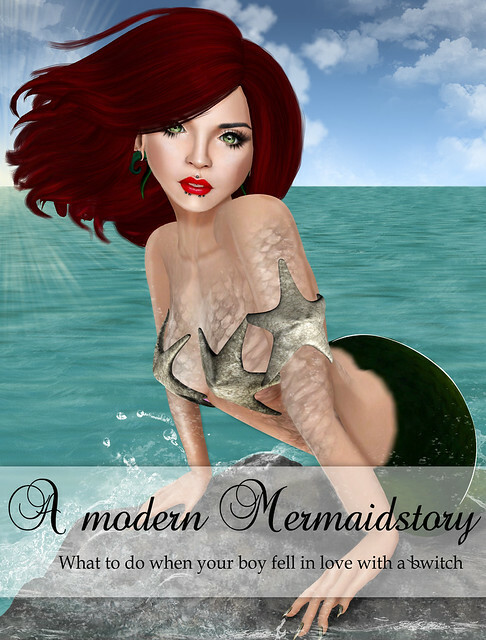 after spending my weekend with my son at Sea Life ❤ i found out that the new Genre Round just started and it is themed to Merfolks. Wimey is part of this round and came up with this beautiful Bra and Cuff for it which come in silver an gold. Also Skinfair is still running and there you can find this beautiful lady called Jemma from Clef de Peau. Jemma is the first female skin from Clef de Peau and i have to say, he did well. ❤ I like those soft small lips and the nose has a great look with those tiny nostrils. You can purchase Jemma in 5 Tones, 6 Make Ups and a Bare version. Yes a bookcover cause after taking my rawshots yesterday i struggled again over the Blog from Strawberry and find a new Monday Meme which is called the Book Cover Meme) and i just want to make it so i endet up in this. If you want to make it too here are the instructions: Create a book cover to show your avatar in fiction. It does not have to be based on a real book, it can be one that you make up.